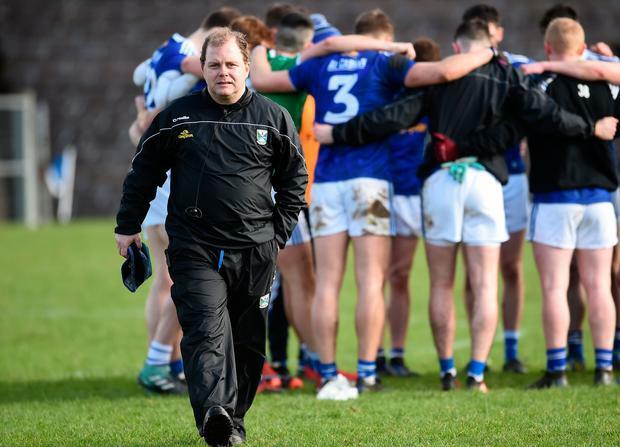 Who better than Mickey Graham to convince Cavan's players of their collective ability to cause a major, if somewhat belated, upset on Sunday? "I suppose it's just shows what can be done," says Cavan manager Graham. "Nothing is impossible." The giant-topping result to which Graham refers in the Leinster club football final last December, when his Mullinalaghta team executed one of the great shocks in modern GAA club competition. It was an instant classic in the genre of small rural club overcoming the big, populated side from the city. The context is Cavan's looming clash with Dublin in Breffni Park on Sunday, a fixture not dissimilar in the contrast between the participants. Cavan, barring an unlikely contrivance of results and a handsome victory themselves, are almost certain to spend next spring where they played their football last spring: Division 2. Dublin meanwhile, may look a little uncharacteristically uncertain about themselves at the moment but so too do they come to Cavan equipped with some of the game's great modern footballers having accumulated a Fort Knox worth of medals and trophies. "If you have the right bunch of players and you have commitment and you have everybody pulling in the one direction and you have the rub of the green..." Graham goes on, citing that memorable recent experience with the Longford champions. "You need luck along the way too - all them things combined can help you." "And when you get to a one-off game it's all on the day and about the frame of mind you are in and the frame of mind of the opposition. "It's probably one of the biggest underdog stories in the GAA in a long time and I know from other clubs that have contacted over the last number of months; it's given all of them hope. "So hopefully you can see it now maybe that other counties will see an opportunity there now - that Dublin have lost a few games and maybe there's a chance that someone can make the breakthrough and break the monotony." Naturally he watched with interest last Saturday evening as Dublin meekly surrendered their chance of making a seventh League final appearance in a row. Nothing about it struck him as particularly significant in a long-term context. "It's hard to know where Dublin are at," he shrugs. "They are probably in the middle of their pre-season at the moment you know whereas other teams have been working away since November they probably only started back in mid January and then they have a few injuries as well. "Tyrone are probably a few weeks further down the road than Dublin are and Dublin are a few weeks preparation wise. "While it was a great result for Tyrone, I wouldn't read too much into it from a Dublin perspective because they will be a different animal in the summer. "And," adds Graham, "if anyone thinks any different they are going to be proven wrong." Naturally there were little nuggets of wisdom in Mickey Harte's game plan, a radically altered method of playing Dublin from recent meetings. "Tyrone are evolving again and are looking to change their tack," Graham outlines. "They tried to do it at the beginning of the league and it wasn't working and they went back to their tried and tested system but they definitely added a few tweaks to it. "Any day you come to Croke Park and get a win against Dublin is a good result." A similar result for Cavan on Sunday is unlikely to spare them immediate relegation back to Division 2. For that to happen, they must win by at last six points and hope that Roscommon draw with Kerry in Hyde Park while Mayo beat Monaghan in Castlebar. "Look, we'll not paper over it, it's hugely disappointing," Graham acknowledged. "Because I feel that while results haven't gone our way, we were learning at times but we didn't learn as quickly as I'd hoped. "But definitely the lads have come in there and they've seen a big step up in intensity. And you'll only get better like that. "But it's a harsh lesson".